They have released as gift for wall Street users 2 other versions: Wall Street Asia (an asian scalper ) and wall Street recovery PRO. There must have been a reason why this thread was not updated for a few years, right? Common sense. I’ll tell you what that reason is (probably). The leverage the is a killer. When the trades go against you and you are leveraged the drawdown gets bigger and bigger, take that growth bot as an example. When that happens brokers have different margin calls so I am sure many got wiped out when it happened. The bots that you are seeing there (the majority that is) are nothing but successful gamblers. After WallStreet made the profit the leverage was cut back. What do you think will happen after it starts making losses? The leverage will go back up and if the losses continue the bot will drown everyone with it. That’s my opinion. I see your posts are all for DD markets which is not an EA, so i suppose your experience on automated trading is very limited and your post shows clearly that you are not able to discern a successfull trend retracement EA like Wally and a gambler EA. I suggest you to study more about automated trading, it requires a very hard work of analysis, testing and evaluating which is not for all. There is not a 100% safe strategy (manual or automated) but facts (not words) shows that Wally is the most consistent EA on the market. Can you show some myfxbook link running DD market signals with similar results to Wally? I know a great deal about EA’s. To make a 20% ROI in a month means taking risks and those risks are reflected in the leverage. The owner of the EA has been very fortunate at the beginning when the EA took huge risks and they paid off. However, if the EA continues to take big risks you will see it will wipe 30% - 50% of the account in a single month. EA’s that do not take huge risks do not make 20% a month. So if you are comfortable taking huge risks that’s ok, I don’t. In regards to ddmarkets, they don’t manage anyone’s money nor do they tell you how much money to risk per trade. One trader can make 15% ROI over one trade and the other only 4%. This is risk management. You are overlooking the risks this WallStreet EA is taking but I am certain you will notice them soon, just like Keltner and that Growth bot. By the way, you are not the only one that is overlooking this. There many traders that just pay attention to the ROI and consistency and not the risks taken by the EA. These traders only realize it when it’s too late. I am aware of that. But by doing so your performance will be completely different that what is displayed. So like I said before, the performance of WallStreet is so high as the EA took huge risks and they paid off. When there will be consecutive losses and it bounds to happen at some point as you know this will end up causing big losses. If you adjust your risk management as you said, your losses are likely to match you profits so there will be very little ROI if at al. WallStreet Forex Robot looks like a good EA. Can you share your thoughts about it for these days, please ? I have checked the charts on their official websites. I am curious about it. What do you think ? i posted it yesterday on another forum. Its maybe a good time to start now with wally. Okay guys/gals I took the plunge. I have wallstreet forex robot running on my live account. I forward test on live accounts its the only way to go. I will be setting up a demo with hotforex and run it there as well. As usual I will keep you guys updated. Time to see if this bot is worth the steep asking price. At least I had a coupon code took a little sting out but if this bot is as good as they say than it should pay for itself 10fold. looks like the EA went bust because the equity drop rapidly? 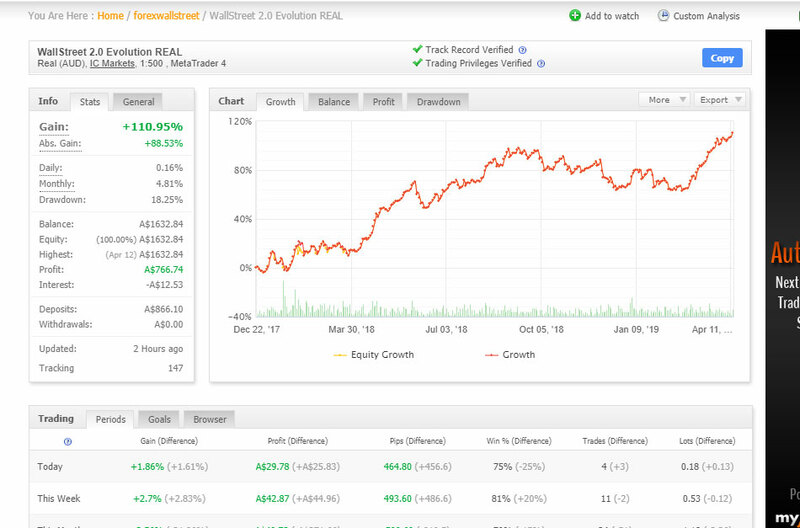 Does anyone have the lastest updated version of wallstreet forex robot? I have the same question. Is there an update on this? Not seems good for me but is here anybody using it right mow?